Last weekend a local farmer held a 'pick your own pumpkin' event. We went along. The farm was miles along very badly maintained road but plenty of other people made the journey as well and the car park was near to full. It was great fun. As well as pumpkins and squashes the farm also grew maize and sugar beet both for biofuel. The farmer kindly gave me two heads of maize and advised me that they could not be cooked the same way as sweetcorn. This was Indian Corn the intact heads of which are sometimes hung up as kitchen decorations. Having been born after the Second World War and very shortly after the end of rationing I was always taught as a child not to waste food. The two heads of maize looked golden yellow and too good not to eat but I did not know how to cook them. Looking online I found that native Americans simmered their maize with wood ash from the fire and then, after rinsing, boiled them again for a couple of hours at which point they could be used in soup, porridge, or dried and ground to make flour. I used lime water, decanted off slaked lime, for the first stage of the process (nixtamalisation). I simmered the dehusked maize for 30 minutes and then left it over night before rinsing and then boiling in fresh water for two hours. 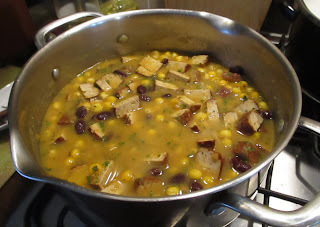 I then made a vegetarian version of a traditional native American soup (http://allrecipes.com/recipe/235957/mohawk-indian-corn-soup) with red kidney beans and smoked tofu. Here is the finished recipe. It was very nice. Shakespeare mentions America only once in his works in the play Comedy of Errors Act 3, Scene 2. Antipholus of Syracuse - "Where America, the Indies?" Dromio of Syracuse - " Oh, sir, upon her nose all o'er embellished with rubies, carbuncles, sapphires, declining their rich aspect to the hot breath of Spain; who sent whole armadoes of caracks to be balast at her nose." Miranda's Brave New World in The Tempest Act 5 Scene 1 is actually an uncharted island in the Mediterranean and not the Americas. "Here's another letter to her: she bears the purse too; she is a region in Guiana, all gold and bounty. I will be cheater to them both, and they shall be exchequers to me; they shall be my East and West Indies, and I will trade to them both. Go bear thou this letter to Mistress Page; and thou this to Mistress Ford: we will thrive, lads, we will thrive." Antonio in The Merchant of Venice cannot pay his creditors and is forced to borrow money from Shylock. In Henry Vth Act I Scene 2 the Archbishop of Canterbury speaks of merchants and trading abroad "Others, like merchants, venture trade abroad". When the first Europeans arrived in North America they found that the wheat and oats and barley seeds they took with them did not grow very well. However, the native Americans taught them how to grow maize which was one of their staple crops. Maize is easy to grow and the seed is planted deep in the soil where rodents cannot easily dig it up to eat. One acre of maize could yield 15 bushels of maize and 100 bushels would feed a family of six for a year. Maize was easy to store as well. When Thomas Harriot visited Virginia he would have undoubtedly eaten maize soup like the one I prepared today but probably with pork instead of tofu!! Maize sustained the early colonists and tobacco provided them with a source of revenue. Without maize and the kindness of the native Americans who showed the early European colonists how to grow it and cook it the establishment of a viable colony in North America might not have happened in Shakespeare's lifetime.